Looking for a New Home or Condominium in Aspen? | Aspen Snowmass Real Estate :: McKinley Real Estate Sales, Inc. Looking for a New Home or Condominium in Aspen? Are you looking for a new (or newer) home in Aspen? There are 15 homes on the market in the Aspen area that were built within the past two years. Two of those are under contract, so 13 still for you to choose from. 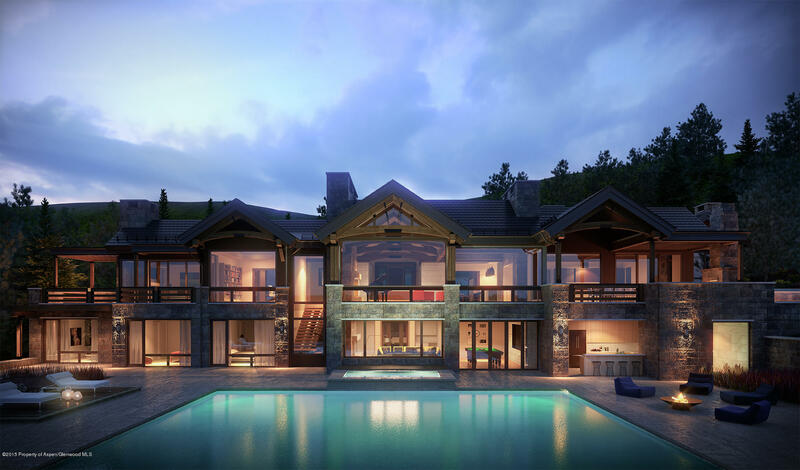 455 Sunnyside is one of the most beautiful homes in Aspen with 8 bedrroms, 11 baths and over 14,000 square feet. This home is located just a few minutes outside of Aspen – take Cemetery Lane off Highway 82 to McLain Flats to Sunnyside. This popular McLain Flats location offers all day sun, views of the ski areas and mountains. With an indoor pool, outdoor pool, theatre, patio kitchen this home welcomes large families and parties. Current list price $36,000,000. 126 Miners Trail listed for $26,000,000 is currently under construction and will offer the finest finishes, construction and contemporary design. The home will have a modern design utilizing wood, zinc, limestone and cantilevered planes along with incredible mountain views. 720 Willoughby Way listed for $24,500,000 is under construction and under contract with a buyer scheduled to close towards the end of the year. 991 Moore Drive located in Five Trees is also under construction. It is listed for $16,950,000 and is under contract scheduled to close in September. An ultra-modern home was just listed near downtown Aspen at 905 E. Hopkins for $14,950,000. The home will have 4 bedrooms, 5 baths, and 4,860 square feet on a 6,000 square foot lot. The neighboring lot may be purchased to add to the privacy for a total price of $19,950,000. The new home at 1118 Waters is under contract. It is a modern, luxury home offering the new owner 5 bedrooms, 7 baths, over 5,800 square feet on .21 acres for $12,847,000 closing in August 2015. Looking for acreage for your new home? A fabulous new home on McLain Flats offered for $11,995,000 will have 5 bedrooms, 7 baths, situated on just under 8 acres. The home will have the finest finishes and no sub-grade spaces. Just off Cemetery Lane only 5 minutes to downtown Aspen is a modern masterpiece with 6 bedrooms, 8 baths, 6,250 square feet on .34 of an acre. This home has 360 degree views of the surrounding mountains, wine room, media room, fitness area, and an outdoor kitchen. Completion estimated for September 2015. A brand new home located in the West End is listed for $8,300,000. It will have 4 bedrooms, 5 baths and 3,970 square feet, a master bedroom deck, 4 en-suite guest bedrooms and a 2 car garage. The neighboring home can also be purchased and is also under construction ready for your family compound creation. The Jerome Professional building remodel/re-built will offer 4 condominium properties. A 3 bedroom, 3 bath, 2,000 square feet, 1 car garage, for $6,000,000. Give us a call to tour these new homes in the Aspen Real Estate Market today!